Estero Beach & Tennis, 9th Floor, Direct Gulf View - Amazing Sunsets! 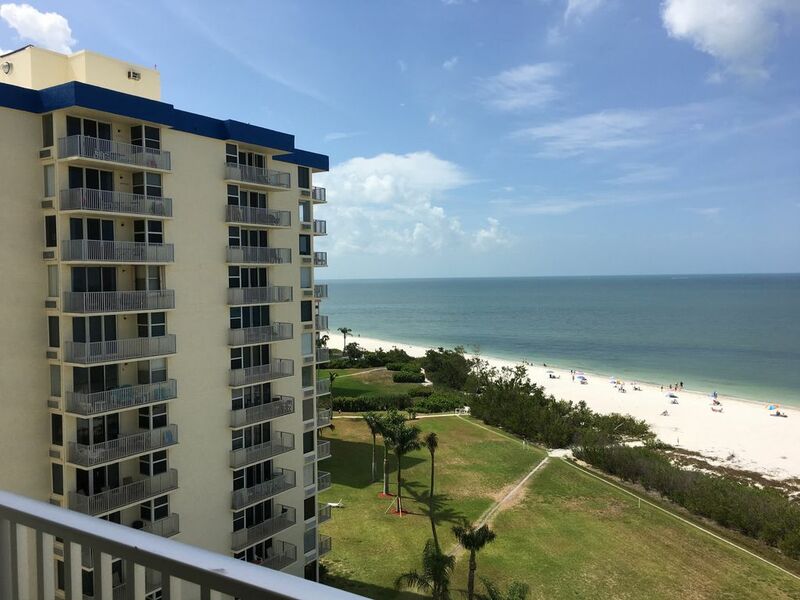 Condo directly on the beach - Newly Updated! Building "A" - 1 bedroom, 1 bathroom, 517 square foot 9th floor condo with direct gulf view. Newly painted August 2018 with new furniture and decor. New 48” flatscreen TV. This condo at Estero Beach and Tennis is directly on the beach with breathtaking views of the gulf. Watch the sunset from the 9th floor lanai. There is a fully equipped kitchen for your vacation stay. The bedroom has a king sized bed. The living room has a double reclining couch, flat-screen TV with free secure wifi and DVD player. There is a sliding accordion partition for privacy to the bedroom. The bathroom has a tub/shower combination and hair dryer. For your beach vacation, you will find Tommy Bahama beach chairs and umbrella, beach towels, cooler, and noodles. Directly across street from Santini Plaza where you can walk to shopping and restaurants! We have 3 condos in Fort Myers Beach. We bought our first condo in 2013 at Casa Marina, followed by a second condo in Casa Marina in 2016. Estero Beach and Tennis we bought October 2017. We love the beach and all three condos offer comforts of home, yet set up for a great beach vacation. We vacation in FMB every couple months and enjoy every moment there. A condo on the beach! 9th floor straight view of the gulf and beautiful FMB sunsets. A step out of the building to the beach for walks, shelling, swimming and just sitting and going nothing on the beach. Estero Beach and Tennis offers one week rentals. Security office on site. Secure building. This was our second stay at the complex and have already booked for next year. You cannot beat the view , convenience of location, access to beach and nice people. A great place to book a week of relaxation, nice beach and sunsets! We thoroughly enjoyed the week in your condo. Beautiful gulf views from the high top table and chairs on the balcony, clean and updated unit, steps away from the sand in your toes, and a hop, skip & limbo to the tiki bar! What's not to love. Thanks again for a wonderful stay at your condo unit located on a small piece of paradise. We have been fortunate to stay in this complex several times and this unit ranked right up there .... the view greets you the moment you open the door and you know you have made a wonderful choice. The condo is fresh and spotless and the furnishings modern and well done. Having good quality beach supplies is always appreciated and the key free entry is a great touch. The owner is approachable and open to your feedback and is involved in the process of keeping this pearl a place we hope to return to time after time... we truly enjoyed our time here. Kristie is the best owner to work with. The villa is decorated just as shown online, bright and beachy! If you have any questions, she promptly responds to your needs. We hope to return often. Clean, comfortable, well-stocked, great location, and amazing views! The property had everything we needed! We especially enjoyed the view and sounds of the beach from the balcony! i loved the view. the condo was very clean and had everything that you would need. i love the location of this complex which is across from santini plaza. i would highly recommend renting this unit. the owner was very easy to deal with.